Highly relevant today, World War II has much to teach us, not only about the profession of arms, but also about military preparedness, global strategy, and combined operations in the coalition war against fascism. During the next several years, the U.S. Army will participate in the nation's 50th anniversary commemoration of World War II. The commemoration will include the publication of various materials to help educate Americans about that war. The works produced will provide great opportunities t learn about and renew pride in an Army that fought so magnificently in what has been called "the mighty endeavor." World War II was waged on land, on sea, and in the air over several diverse theaters of operation for approximately six years. The following essay is one of a series of campaign studies highlighting those struggles that, with their accompanying suggestions for further readings, are designed to introduce you to one of the Army's significant military feats from that war. This brochure was prepared in the U.S. Army Center of Military History by Charles R. Anderson. I hope this absorbing account of that period will enhance your appreciation of American achievements during World War II. On 7 December 1941, Imperial Japanese forces turned their war on the Asian mainland eastward and southward into the Pacific with simultaneous attacks on Pearl Harbor, the Philippines, Wake, Guam, Hong Kong, and the Malay Peninsula. The rapid southward advance of Japanese armies and naval task forces in the following months found Western leaders poorly prepared for war in the Pacific. Nevertheless, they conferred quickly and agreed that, while maintaining the "German first" course they had set against the Axis, they also had to blunt Japanese momentum and keep open lines of communication to Australia and New Zealand. As the enemy closed on those two island democracies, the Allies scrambled to shore up defenses, first by fortifying the Malay Barrier, and then, after Japanese smashed through that line, by reinforcing an Australian drive north across New Guinea. To make this first Allied offensive in the Pacific more effective, the Americans mounted a separate attack from a different direction to form a giant pincers in the Southwest Pacific. This decision brought American forces into the Solomon Islands and U.S. Army troops onto the island of Guadalcanal. respective military potential of the major powers in various geographical areas. The British would concentrate their efforts in western Europe and the Mediterranean theaters, while the United States would carry the burden of limited offensives in the Pacific. On 30 March 1942, the American Joint Chiefs of Staff made a further division of responsibility for the War and Navy Departments. The U.S. Navy assumed operational responsibility for the vast Pacific Ocean Areas and gave the new command to Admiral Chester W. Nimitz, commander in chief of the Pacific Fleet since shortly after the attack on Pearl Harbor. The U.S. Army took operational control of the Southwest Pacific Area, assigning the command to General Douglas MacArthur, recently ordered from the Philippines to Australia. MacArthur's new command encompassed the seas and archipelagos south of Formosa and the Carolines, east of the Malay Peninsula, and west of New Caledonia, an area including the Philippines, the Netherlands East Indies, Australia, and New Guinea. On 20 April the Joint Chiefs established a subdivision of the Navy's Pacific Ocean Areas command - the South Pacific Area, under Vice Adm. Robert L. Ghormley - which included New Zealand, important island bases at the end of the South Pacific ferry route from Hawaii, and the Solomons, a former British protectorate only 500 miles east of New Guinea. Ghormley had the mission of blocking the Japanese before they cut the South Pacific ferry route and severed Australia and New Zealand from the United States. 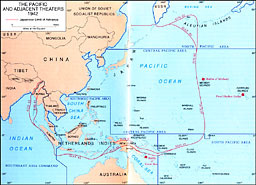 The line between MacArthur's Southwest Pacific Area command and Ghormley's South Pacific Area command divided the Solomons at a point 1,100 miles northeast of Australia. Obviously, any operations in defense of Australia or New Zealand and the South Pacific ferry route would depend on close Army-Navy cooperation. 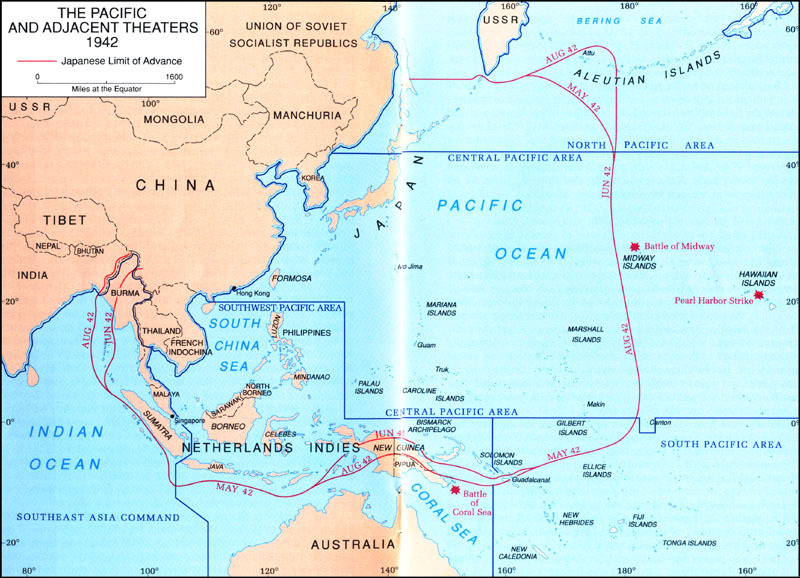 The Allies mounted their first attempt to stop the Japanese at the Malay Barrier, a 3,500-mile-long line from the Malay Peninsula through the Netherlands East Indies and ending in the British Solomon Islands. The four nations contributing men and arms to the Malay Barrier defense established the American-British-Dutch-Australian Command (ABDACOM) to direct their effort. 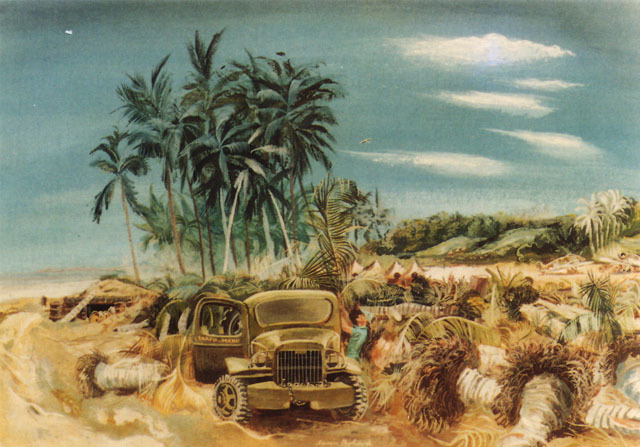 Though unsuccessful - the Japanese punched through the Malay Barrier in January 1942 - ABDACOM gave the Allies valuable experience in coalition warfare and combined operations. even the modest goal of containing the enemy. A convoy sent to reinforce the Philippines but diverted to Australia when the Japanese attacked Pearl Harbor had brought 4,600 air forces and artillery troops to Australia. Four thousand of these men still awaited deployment. In January Army Chief of Staff General George C. Marshall had dispatched another reinforcement to Australia - this one numbering 16,000 men - and placed it under command of Brig. Gen. Alexander M. Patch. Combined with American forces already in Australia, this force would form the nucleus of an infantry division and air wing. The collapse of ABDACOM did not stop dispatch of American forces to the South Pacific. In the early months of 1942 a number of separate Army ground units shipped out for New Caledonia, and the first complete division - the 37th Infantry Division, a National Guard unit from Ohio boarded transports for the Fiji Islands. In June the U.S. Joint Chiefs of Staff began planning an independent American offensive, and at the same time deployed Army Air Forces and Marine Corps air squadrons to support the campaign. In late June and early July the 1st Marine Division arrived at Wellington, New Zealand. The increase in Army troop strength led the War Department to organize a new command for the imminent operations: U.S. Army Forces in the South Pacific Area, commanded by Maj. Gen. Millard F. Harmon. While the Americans struggled to send enough men and arms to protect Australia, the Japanese rapidly consolidated their gains in the South Pacific. The Imperial Japanese Navy exercised theater control in the South Pacific through its Southeastern Fleet, headquartered at Rabaul. The Imperial Japanese Army organized its troops in the area into the Seventeenth Army, commanded by Lt. Gen. Harukichi Hyakutake. Imperial forces built naval port facilities, leveled land for airfields, and fortified jungled hill masses to hold the islands they had taken and to support subsequent operations on the march to Australia. Each island group had at least one strongpoint; some had several. Large bases were built in the Palaus and the Carolines and at Rabaul in the Bismarcks. Smaller bases held the Marshalls and the Gilberts, in addition to New Britain and New Ireland in the Bismarcks and Buka, Bougainville, and Guadalcanal in the Solomons. By the middle of 1942 the American Joint Chiefs faced options of dubious merit: they could find the Japanese in almost any direction they turned. American loss of two aircraft carriers was also significant. Although the Coral Sea and Midway engagements did not give the Americans undisputed access to the South Pacific, they did bring the naval balance of forces close enough that the Americans could realistically consider an amphibious operation. In this more favorable tactical situation, the Joint Chiefs of Staff in July proposed a two-pronged assault, one in a northwesterly direction up the Solomon Islands, and the other from Port Moresby on the south coast of New Guinea north across that island. Of all enemy strongpoints in the South Pacific, that on Guadalcanal appeared most threatening because it lay closest to Australia and to the South Pacific ferry route. If the Americans were going to blunt the Japanese advance into the South Pacific, Guadalcanal would have to be the place, for no other island stood between the Solomons and Australia. 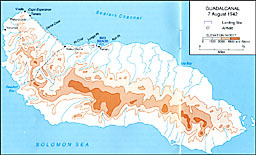 Ninety miles long on a northwest-southeast axis and an average of twenty-five miles wide, Guadalcanal presented forbidding terrain of mountains and dormant volcanoes up to eight thousand feet high, steep ravines and deep streams, and a generally even coastline with no natural harbors. With the south shores protected by miles of coral reefs, only the north central coast presented suitable invasion beaches. There the invading Japanese forces had landed in July, and there the Americans would have to follow. Once ashore, invaders found many streams running north out of the mountains to inhibit east-west movement. A hot, humid climate supported malaria and dengue-carrying mosquitoes and posed continuous threat of fungal infection and various fevers to the unacclimated. The Melanesian population of the island was generally loyal to Westerners. 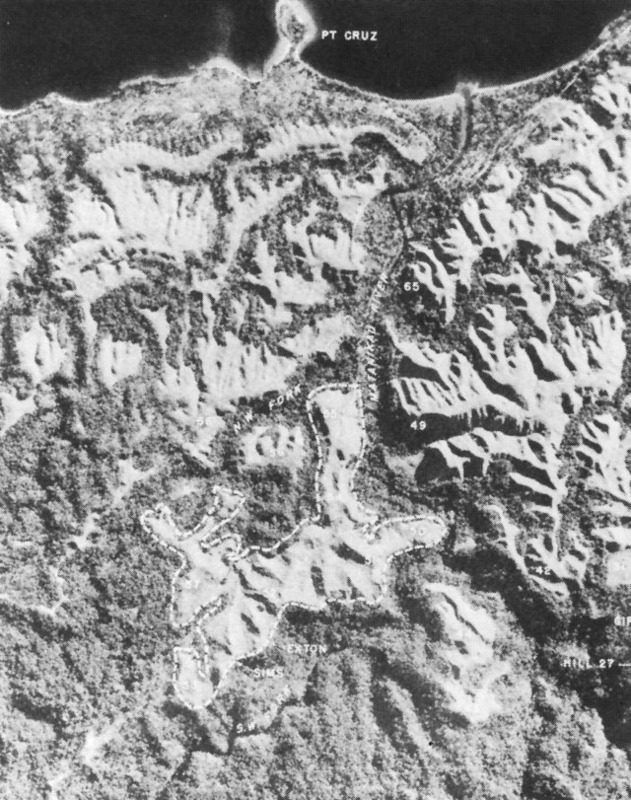 Prior to the American landing in early August, the Japanese had not tried to fortify all terrain features, but concentrated on the north plain area and prominent peaks. They had built an airfield at Lunga Point and many artillery positions in nearby hills. At 1,514 feet, Mount Austen stood as the most important objective to anyone trying to hold or take the north coast. By August General Hyakutake had a force of some 8,400 men, most in the 2d Division, to hold the island and build airfields. Japanese naval superiority in the theater assured him of sufficient troop inflow--the 38th Division would land later--to realize his plans for a two-division corps. Admiral Ghormley commanded both Navy and Army units. On the Navy side of the joint command, Maj. Gen. Alexander A. Vandegrift (USMC) commanded the 1st Marine Division, the assault landing force. 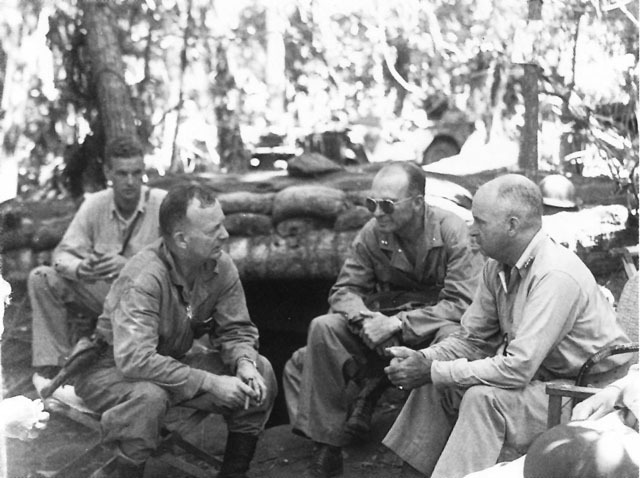 Army troops committed to Guadalcanal came under command of Maj. Gen. Millard F. Harmon, as Commanding General, South Pacific. On the morning of 7 August 1942, the 1st Marine Division followed heavy naval preparatory fires and landed across the north beaches east of the Tenaru River. In a three-month struggle marked by moderate battlefield but high disease casualties and accompanied by sea battles that first interrupted and finally secured resupply lines, the marines took the airfield and established a beachhead roughly six miles wide and three miles deep. On 13 October the 164th Infantry, the first Army unit on Guadalcanal, came ashore to reinforce the marines and took a 6,600-yard sector at the east end of the American perimeter. Commanded by Col. Bryant E. Moore, the 164th had come through the South Pacific ferry route in January to New Caledonia. There, the 164th joined the 182d Infantry and 132d Infantry Regiments, in addition to artillery, engineer, and other support units, to form a new division called the "Americal," a name derived from the words America and New Caledonia. Until the Americal commander, Maj. Gen. Alexander M. Patch, and other units of the division arrived, the 164th would fight with the marines. The newest American unit on Guadalcanal, the 164th moved into the southeast corner of the perimeter. On the night of 23 October, Moore and his troops heard the Japanese begin their attempt to retake the Lunga Point airfield, renamed Henderson Field by the marines. Two nights later the Japanese hit the 164th, running out of the dark jungles yelling "Banzai," throwing grenades, and firing every weapon they could carry. Despite armor, artillery, air, and naval support, the Japanese could achieve no more than temporary breakthroughs at isolated points. The men of the 164th put up a much stiffer defense than the Japanese expected of a green unit, and with the marines repulsed the enemy with heavy losses while losing 26 killed, 52 wounded, and 4 missing. Once the enemy attack failed, Vandegrift had four experienced regiments manning a secure line. General Vandegrift now moved into the second phase of his operations on Guadalcanal: pushing out his perimeter far enough so that Japanese artillery could not reach Henderson Field and overrunning the Seventeenth Army headquarters at Kokumbona, nine miles west of the airfield. On the morning of 1 November, following naval, air, and field artillery fire, Marine units began the attack both east and west. On the 4th the Army's 1st Battalion, 164th Infantry, joined the western attack, while the 2d and 3d Battalions, 164th, moved to the eastern front. The Army battalions assisted in a major victory during 9-12 November when they trapped against the sea 1,500 enemy troops who had just landed at Koli Point. Soldiers and marines killed half the enemy force in a twoday fight; the rest escaped into the jungle toward Mount Austen, six miles southwest of Henderson Field. the enemy never again tried a large-unit reinforcement. Only 4,000 troops, of 10,000, reached land, and the 38th Division had to function as a large but underequipped regiment. The attack toward Kokumbona resumed on 18 November with the 164th Infantry, two battalions of the newly arrived 182d Infantry, and a Marine regiment. After advancing only one mile against strong opposition, the attack stalled on the 25th. The 164th Infantry alone lost 117 killed and 625 wounded or sick. Rather than continue the costly push into the jungle, American commanders decided to await reinforcements. But rather than receiving reinforcements, the Americans lost effective combat units in December. Vandegrift's battle-hardened but diseasewracked 1st Marine Division boarded ships for a much-deserved reconstitution, leaving General Patch in command of all American units on the island. Despite this temporary reduction, Patch wanted to mount a limited offensive before the enemy strengthened positions any further. He planned to take Mount Austen to secure both Henderson Field and his left flank for the next push toward Kokumbona. Forces available for the Mount Austen operation included the complete Americal Division, the 147th Infantry, two Marine regiments, and four field artillery battalions. position after a Japanese prefecture. Inside the Gifu, five hundred troops manned over forty log-reinforced bunkers arranged in a horseshoe on the west side of Mount Austen. During the last ten days of 1942 the 132d hammered Gifu repeatedly, making little progress at a cost of 34 killed and 279 other casualties, mostly sick. Finally, on 1-2 January 1943, the 1st and 3d Battalions attacked from the north while the 2d Battalion swung around and attacked from the south to overrun most of the Gifu strongpoint and secure the west slopes of Mount Austen. Now the Americans could move against Kokumbona without fear of enemy observation or fire from the rear. In the 22-day battle for Mount Austen the 132d Infantry had killed between 400 and 500 Japanese but in the process lost 112 killed and 268 wounded. a new headquarters, XIV Corps, and assigned General Patch to its command. The 25th Infantry Division and the rest of the 2d Marine Division joined the Americal Division on the island to fill out a three-division corps in preparation for a January offensive. Patch now planned to destroy the Japanese on Guadalcanal rather than simply to push them farther away from the Henderson Field perimeter. With the newly arrived units, he could expect to make more progress than in the previous two months. Japanese troop strength on the island had peaked at 30,000 in November, but then fell to about 25,000 in December. With supplies from the Tokyo Express steadily falling and malaria casualties rising, General Hyakutake had no choice but to scale down his objectives. On 10 January XIV Corps began its first offensive of the new year, with Patch pointing almost all of his units west. Maj. Gen. J. Lawton Collins' 25th Division took over the Gifu-Mount Austen area and moved west across the Matanikau River against a hill mass called Galloping Horse after its appearance from the air. The 2d Marine Division tied in with Collins' right flank and advanced west along the coast toward Kokumbona. Most of the Americal Division took over the Henderson Field perimeter, except the 182d Infantry, one battalion of the 132d Infantry, and division artillery, all of which supported the corps attack. Col. William A. McCulloch's 27th Infantry led the assault on Galloping Horse at first light on 10 January. In support, six field artillery battalions tried an innovation Collins hoped would deny the enemy the usual warning given when rounds fired from the nearest battery struck before those of the main concentration, allowing troops in the open to seek cover and move equipment. Called "time on target," the technique depended on careful firing sequencing so that all initial projectiles from whatever direction and distance landed at the same time. Thereafter the batteries would fire into the kill zone continuously but at irregular intervals through an extended period, thirty minutes in this case. The technique seemed to be effective, for soldiers later advancing through such zones found little opposition. Battalion made better progress than the 3d, but by the second day both units experienced another problem: a shortage of water. The Americans had expected that the many streams on mountainous Guadalcanal would provide water inland and were surprised to find most stream beds dry. The need to transport water threatened to slow operations seriously. exhausted by enemy resistance and water shortage. Colonel McCulloch pulled the unit back for a rest and moved the 2d Battalion up to continue the advance along the body of the Horse. Company E soon stalled against a ridgeline between Hills 52 and 53. For the men involved, the battle now evolved into intense struggles between fire teams and individuals in the hot jungle and steep ravines. in a crawl up to the enemy strongpoint. The Japanese threw grenades first, but they failed to explode. Davis and his men threw theirs, then charged before the enemy could recover from the blasts. Firing rifles and pistols into the position, Davis and his men finished off the stub-born enemy, and Company E swept up the ridge. For his initiative Davis was awarded the Medal of Honor. As if in reward, a heavy rain began shortly after Company E took the ridge. Their thirst relieved, the men of the 27th Infantry prepared to take the rest of the Galloping Horse. After Colonel McCulloch put the fire of three artillery battalions on Hill 53, the head of the Horse, company-size assaults from two directions swept forward through the feeble resistance of starving and sickly Japanese. By the afternoon of 13 January McCulloch's men held the entire Galloping Horse hill mass. the troops had more trouble with the terrain than the enemy, until Company K tried to cross a stream between the head and body of the Sea Horse. Anxious to continue the advance, the Americans waded into the water before posting adequate fire cover. With the company split over the two sides of the stream, Japanese machine gunners began firing on the inviting target below. Fortunately for the Americans, two men in the company saved the situation. Sgt. William G. Fournier and T5g. Lewis Hall turned a machine gun on the enemy, now mounting an infantry rush on the disorganized Americans, and broke up the attack before receiving mortal wounds. For saving Company K from disaster, Fournier and Hall were awarded posthumous Medals of Honor. After Company K regrouped, the 3d Battalion attack picked up momentum. By nightfall on 10 January the Americans had half the Sea Horse surrounded, and Colonel McClure began relieving 3d Battalion companies with those from the 1st Battalion. The next day the attack resumed against weak resistance. When the Japanese massed machine-gun fire on the 3d Battalion, the 1st Battalion rejoined the attack, and the two units drove the enemy completely off the Sea Horse by late afternoon on the 11th. In four days of combat 25th Division troops had taken two important objectives in their January offensive. To consolidate his gains in the Galloping Horse-Sea Horse area, General Collins brought forward his last maneuver regiment-the 161st Infantry. During the third week of January the fresh regiment fought several sharp firefights to clear isolated stream beds and ravines between the major objectives now in American hands. enemy. On the 21st three Marine light tanks joined the assault and tipped the balance of combat power. The next day the tanks punched through the northeast side of the strongpoint and roared on out the south side, along the way knocking out eight machinegun positions and opening a 200-yard hole in the enemy line. Still unwilling to surrender, the Japanese mounted a desperate attack the night of 22-23 January. The 2d Battalion troops turned back the enemy with heavy losses and the next morning mopped up the Gifu. Three days after the 27th Infantry and 35th Infantry assaulted the Galloping Horse and Sea Horse, the marines kicked off their advance along the coast. In its first operation as a complete unit, the 2d Marine Division moved west on a two-regiment front on 13 January. After gaining over 800 yards at a cost of six killed and sixty-one wounded, the marines stalled on the 14th under heavy enemy machine-gun and mortar fire from ravines to their left. Adding tanks the next day helped little, but a new weapon - flamethrowers - proved more effective in driving enemy crews away from weapons. By the 17th the marines had regained their momentum. In five days of combat they killed 643 Japanese and took 71 machine guns, 3 artillery pieces, and a large quantity of rifles and ammunition. The next day they stopped a mile west of Point Cruz to await further orders from General Patch. By 18 January XIV Corps had pushed two miles west of the Matanikau River and over four miles inland. In taking the major objectives of Galloping Horse, Sea Horse, the Gifu, and the coastal strip beyond Point Cruz, the XIV Corps killed 1,900 Japanese while losing fewer than 200 killed and 400 wounded. Enemy survivors not yet immobilized by malaria or starvation were reeling back toward their last stronghold on Guadalcanal, Seventeenth Army headquarters at Kokumbona. 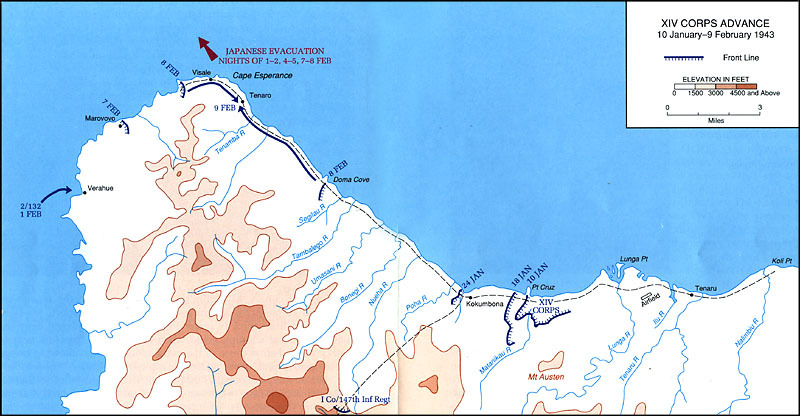 To complete the destruction of Japanese forces on Guadalcanal, General Patch planned a follow-up offensive to begin on 2 January. The renewed attack involved a reorientation of XIV Corps toward a point on the coast three miles west of the new perimeter: the village of Kokumbona. To bring his forces to bear on Kokumbona, Patch planned to swing the 25th Division from a direct westerly axis to a northwesterly heading. Then, as that division neared the coast, the 2d Marine Division and other Army units between it and the 25th would have to reduce their front. Thus, by the time the Americans reached Kokumbona, XIV Corps would be pushing a spearpoint only two regiments wide into Japanese defenses. regiments. The result was the Composite Army-Marine (CAM) Division, consisting of two Army regiments, the 147th and 182d, and one Marine, the 6th, plus artillery battalions from both the Americal and 2d Marine Divisions. Other support would come from Navy destroyers offshore and the 2d Marine Air Wing. The remaining regiments from the Americal and 2d Marine Divisions would man the American perimeter east of the Matanikau River. The CAM Division would advance west along the coast on a 3,000yard front while the 25th Division executed its more involved swing to the northwest toward Kokumbona. Bay area. Part of Beach's force sailed aboard Navy landing craft around the western end of the island, while the remainder took a trail network into the hills; the unit assumed its blocking force position on the trail by mid-January. After a heavy artillery and naval gunfire bombardment, XIV Corps moved out toward Kokumbona at 0630 on 22 January. On the corps left, the 25th Division's 161st Infantry soon bogged down in deep jungle. On the corps right, the CAM Division ran into a heavy enemy machine-gun concentration after moving only 1,000 yards. Only the 27th Infantry (25th Division), between the 161st Infantry and the CAM Division, made good progress, covering nearly two miles in less than three hours. Shortly after his division had begun its attack, General Collins noticed the Japanese offered much less opposition than expected in his 27th Infantry sector. Showing the initiative that would later bring him a corps command and after the war lift him to the chief of staff's office, Collins jumped in a jeep, raced to the front, and changed his plan of attack. Despite the danger of allowing one regiment to advance far ahead of its neighbor-the enemy could easily surround the forward unit-Collins perceived the Japanese were incapable of taking advantage of his vulnerability, and he told Colonel McCulloch to push 27th Infantry as far and as fast as possible. The 27th had already outrun its communications wire and would soon leave its artillery support fan, but Collins still saw no reason to wait. With signalmen frantically laying new wire and artillerymen scrambling to displace batteries forward, the men kept going. By nightfall the 27th Infantry had gained over three miles and occupied the high ground overlooking Kokumbona. Along the coast the CAM Division began its attack at the same time with a three-regiment front: the 6th Marines on the beach, the 147th Infantry in the center, and the 182d Infantry abreast of 25th Division on the left. For the first 1,000 yards terrain posed the main problem, but soon the marines came under heavy machine-gun and antitank fire from an estimated 250 Japanese on Hills 98 and 99. CAM Division troops killed over two hundred enemy and captured three 150-mm. guns, a light tank, and other weapons in claiming Hills 98 and 99 and moving into Kokumbona. Anxious to destroy the remaining Japanese before they could prepare defensive fortifications similar to those of Gifu, General Collins sent the 27th Infantry in pursuit beyond Kokumbona. By late afternoon on the 25th McCulloch's men had fought through rearguard actions of varying effectiveness to reach the Poha River, a mile west of Kokumbona. Now the campaign became a race between Japanese survivors trying to reach possible evacuation at Cape Esperance, seventeen miles west of the Poha River, and XIV Corps attempting to trap and annihilate them. McCulloch's victorious but exhausted 27th Infantry stopped at the Poha while the CAM Division moved through to join the chase. Alternating the lead attack position, the 147th Infantry, the 182d Infantry, and the 6th Marines progressed from one to three miles a day through weak resistance. By 8 February these units had reached Doma Cove, nine miles beyond the Poha River and the same distance short of Cape Esperance. force had seen no Japanese since January, General Patch still saw the possibility of an enemy escape from the west end of the island. In a second effort to deny the enemy that option, Patch assembled a task force around the 2d Battalion, 132d Infantry, and sent it around the west end of the island by Navy landing craft to Verahue, ten miles southwest of Cape Esperance. Commanded by Col. Alexander M. George, the force began moving north along the coast on 2 February with the intention of meeting the CAM Division sometime in the next few days. Though the Japanese discovered George's troops and surmised their mission, they offered little opposition; George's men had more trouble pushing their supply trucks through mud and jungle. But on 7 February a Japanese rifleman found a prime target, wounding Colonel George. Lt. Col. George F. Ferry took over, and by the 8th his men stood less than two miles from Cape Esperance. The next day the 1st Battalion, 161st Infantry, swept over six miles west through fast dissolving opposition while Ferry's battalion moved over three miles up from the southwest. The two units met at Tenaro on Cape Esperance but found only a few stragglers. Abandoned enemy equipment and landing craft on the beach explained the empty trap: the Japanese had evacuated most of those who had reached Cape Esperance, about 13,000 troops in all, according to prisoners of war. them, Japanese losses were more significant. Even more costly to Japan was the loss of over six hundred aircraft and pilots. U.S. Army-Navy coordination began poorly due in part to different views of the campaign's purpose. Ground commanders saw the campaign as an amphibious operation with the normal division of joint responsibilities. That is, naval forces would secure the seas around the objective for as long as it took ground forces to clear Guadalcanal of enemy. But higher Navy commanders viewed the operation as more of a raid than a formal amphibious campaign. They reserved the right to react to enemy naval operations as they saw fit without offering uninterrupted fire support to forces ashore, and they acted on that view by leaving Guadalcanal waters twice, in August and October. Later, Army and Navy commanders in the theater arrived at methods of operation generally satisfactory for the initial effort in a major war. For Army tactical leaders, Navy support proved most valuable when ground units operated close enough to the coast that destroyers' guns could reach into the jungled ravines so well fortified by the Japanese. Navy and Marine air support was always welcome but not always well aimed. On one occasion a dive bomber dropped ordnance on an infantry unit advancing toward Galloping Horse. Fortunately, such incidents proved the rare exception in close air support missions. Intelligence about the island of Guadalcanal and Japanese forces on the island proved inadequate throughout the campaign. Before the effort began, the best information on terrain and soil conditions came from missionaries and planters expelled by the Japanese. But the recollections of these sincere but untrained observers were often of dubious quality, most of them more impressionistic than factual. As a result, ground commanders had to fight on Guadalcanal without accurate maps. more than an extremely localized view of the situation. Even in their estimates of the situation on the ground, the four American division commanders in the campaign frequently underestimated the forces they faced, either in size or strength of fortification. The most grievous example occurred at the Gifu, where an enemy pocket originally estimated at 100 men with 10 crew-served weapons turned out to contain over 500 with 52 large weapons. The defenders ultimately held off five American battalions for a month, delaying the advance west long enough for the Japanese to evacuate 13,000 men from the island. In their first combat experience, XIV Corps infantrymen carried out their missions with the mix of enthusiasm, hesitation, and incompetence characteristic of inexperienced troops. In the early stages of the campaign the troops allowed the Japanese to pin them down too often with light weapons. Compounding the error, commanders on the scene showed reluctance to resume the attack without a heavy artillery barrage. While this pattern of behavior may have faithfully conformed to contemporary doctrine, it played to a particular strength of the enemy. Artillery delays used up daylight hours, and the Japanese soon learned that American commanders did not like to initiate assaults in the last two or three hours before sunset. In contrast, the Japanese seemed to relish the onset of darkness and relied extensively on night movement to mount counterattacks and to position assault units and supporting arms for the next day. Until American soldiers stopped viewing sunset as the end of the tactical day and gained more expertise in night operations, they would continue to take unnecessary losses at the hands of their more experienced enemy. Sloppy execution of routine infantry techniques cost some units unnecessary casualties. While approaching the Sea Horse on 10 January, Company K of the 35th Infantry began crossing a stream before properly checking the site or placing covering weapons on the flanks. With half the company on one bank and half on the other, the Japanese fired on the disorganized and vulnerable unit. Careful application of the basic principles of tactical movement, a responsibility of company grade officers and NCOs, would have prevented this disaster. Instead, it took two posthumous Medal of Honor performances to save the day for this company. the unit a full day's advance. 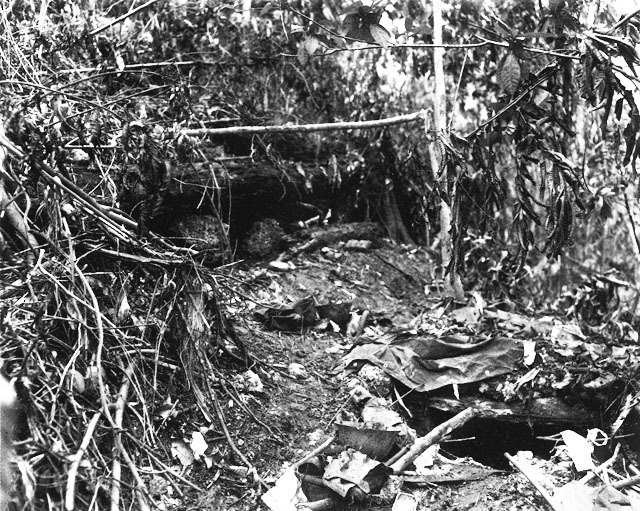 The jungle environment of Guadalcanal forced Americans to fight at very close quarters, a difficult but realistic adjustment to make, for subsequent campaigns in the Pacific would present the same conditions. Enemy positions usually were not visible until attacking troops had closed within fifty feet. The Japanese proved masters of using natural materials found in the jungle to build strong, as well as nearly invisible, fortified positions. Units which thought they had discovered one or two machine-gun positions often found themselves attacking half a dozen or more. And once a network of positions was identified, the bunkers-some with reinforcing logs up to two feet in diameter-proved impermeable to all but direct hits by the largest caliber ordnance. Nevertheless, XIV Corps troops did not hesitate to attack such positions and in so doing innovated effective techniques against them, including flamethrowers to reach into narrow openings. single battalion attacking a minor position on the way to a major objective could call for as much as half an hour's fire. Especially effective in disorienting enemy troops was time-on-target artillery fire, which made extremely difficult the detection of American battery locations, essential for counterbattery fire missions. But American infantrymen found that plentiful artillery support did not translate into an immediate reduction in enemy opposition. Elimination of enemy bunkers required direct hits, a low percentage result for most types of fire support, including air strikes even when pilots could see targets. As assaults moved deeper inland, the terrain of Guadalcanal began to affect fire support. Artillery fire frequently overshot enemy positions in deep ravines or on steep hillsides. A field expedient proved partially effective: propping antitank weapons and pack howitzers against steep slopes to achieve higher angles of fire. One type of fire support-tanks-did not play a major role on Guadalcanal. Although the few tanks present occasionally proved valuable in reducing enemy bunkers, neither Marine nor Army forces had enough tanks on the island to mount sizable tank-infantry assaults. Nor did the terrain of Guadalcanal permit the maneuver of armored columns. Army commanders and troops would have to find more level battlefields to learn armorinfantry coordination. Another type of tracked vehicle-the bulldozerperformed more valuable service for the XIV Corps in the long run by assisting the engineers in airfield and road construction. Supply proved a major problem throughout the campaign, although the character of the issue changed as the battle continued. In the early stages of the campaign the perennial military problem of supply volume threatened to limit operations. But once the Army-Marine invasion force secured the Henderson Field perimeter and began to move inland, the delivery of supplies became the larger difficulty. 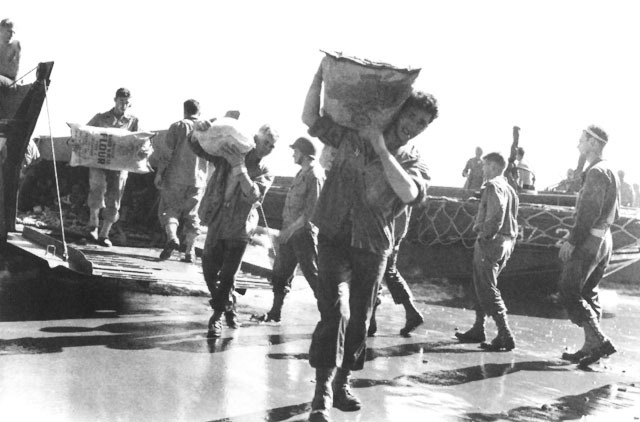 Without port facilities, supplies reached the troops only after a series of timeconsuming and labor-intensive equipment transfers. Supplies were first unloaded from Navy ships offshore into lighters for the trip to the beach. There American service support personnel transferred the tonnage to trucks that hauled it inland to several dumps on roads under construction. From the dumps supplies had to be hand carried, by both Americans and native laborers, to using units. As the fighting moved farther inland the distance between dumps and front line lengthened and road building could not progress as fast as assault units advanced, especially when Japanese forces began to withdraw to their evacuation points. using the many streams and rivers on the island. 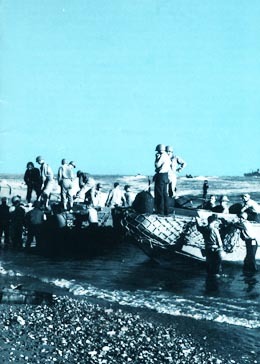 Loading supplies into small boats, some of them captured Japanese craft, Americans pushed the craft through the water as close to the tactical units as possible. Not described in any field manual, the transport expedient called forth a linguistic innovation: "pusha-maru," combining an English verb and the Japanese suffix attached to ships' names. Several troublesome aspects of Army performance on Guadalcanal could not be addressed by more training or troop innovation. Improvements in some areas would have to wait on technological and organizational developments. Ship-to-shore logistics did not keep up with operations ashore because of a shortage of amphibian tractors and landing craft equipped with drop-down bow ramps. Reserving such craft for assault echelons forced the laborious series of unloadings and reloadings that delayed receipt of essential supplies at the fighting fronts. Solution of this multifaceted problem called for a high degree of joint cooperation, for it touched on Navy procedures of embarkation and debarkation as well as Army methods of land transportation and road building. An improved technological base for combat operations in the Pacific held the promise of significantly reducing the cost in time and casualties of taking enemy-held islands. The greatest single factor reducing troop effectiveness on Guadalcanal was disease, particularly malaria. For every man who became a casualty in combat, five fell to malaria. Until a more effective prophylaxis became available, tropical diseases would continue to degrade the efficiency of ground operations in tropical areas. The Guadalcanal Campaign also made clear that whether subsequent fighting in the Pacific took place in an Army or a Navy theater, success would depend on a high degree of interservice cooperation. The early stages of the campaign were dominated by Navy-Marine components of the interservice team. But as the battle continued, Army units assumed the burden of interservice coordination and, in the end, secured the American victory on the ground. The campaign also made clear the scale of operations the Americans would have to mount to take sizable island outposts from the Japanese: between fifty and one hundred thousand troops, at least half a dozen air squadrons of high-altitude bombers, dive bombers, and fighters, and between two and three hundred Navy ships and smaller craft of all types. In coming months fresh Army divisions would form new interservice teams and, applying techniques demonstrated by the XIV Corps, continue the island march to Japan. The Guadalcanal Campaign is one of the most extensively written about of all in World War II, with more than one volume published in each of several categories: official histories, journalistic views, and personal accounts. The authoritative treatment remains John Miller, Jr. Guadalcanal: The First Offensive (1949), a volume in the series United States Army in World War II. Two accounts published during the war have attracted readers from three generations: Richard Tregaskis, Guadalcanal Diary (1943) and Ira Wolfert, Battle for the Solomons (1943). More recent works include Robert Edward Lee, Victory at Guadalcanal (1981), Herbert C. Merillat, Guadalcanal Remembered (1982), and Richard B. Frank, Guadalcanal (1990). See also the HyperWar links to the war on Guadalcanal.